The HPWREN and ROADNet teams recently collaborated to provide two southern California research sites with a broadband network link and an interface to real-time strainmeter data. 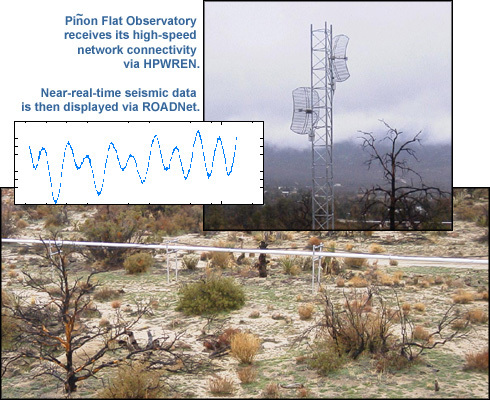 That is, scientists from around the world can now access real-time long-base strainmeter data recorded at the Piñon Flat Observatory and Durmid Hill sites, which are both managed by the Cecil H. and Ida M. Green Institute of Geophysics and Planetary Physics (IGPP) at the Scripps Institution of Oceanography (SIO). Long-base laser strainmeters, spanning hundreds of meters at the Earth's surface, allow scientists to capture high-quality records of time-varying Earth deformation. Deployed in 1970 by IGPP/SIO scientists, the Piñon Flat long-base laser strainmeter is the longest-running and most stable instrument of its kind. "HPWREN connectivity allows field data to flow straight from the strainmeter to a data logger - from there a ROADNet system handles the realtime data transport, display and analysis requirements," explains Todd Hansen, Systems Coordinator for the ROADNet implementation. "The data is then accessible as both a near-real-time web application and a separate X windows based real-time data display. These utilities allow researchers to analyze their data as it becomes available, while previously there was a 12- to 24-hour delay before recordings were available. Now they can reconfigure malfunctioning sensors in minutes instead of days, allowing for more useful measurements and response to important events." "Owing to download limitations, we were previously limited to on-site recordings of all high-frequency signals, which were then recovered in a piecemeal fashion. We were missing much of the action," says Frank Wyatt, SIO/IGPP research geophysicist. "With the new HPWREN/ROADNet system we are observing signals we weren't even aware of." "The recently developed data transport, analysis, and archival system lets scientists graph real-time strain data collected at Durmid Hill and Piñon Flat - while sitting at their campus desktops," further explains Hansen. "They can then compare this information with other data - ranging from data collected via real-time seismic sensors to temperature and humidity levels collected by nearby weather stations." The HPWREN-connected strainmeters receive their network link via five hops - stretching a total of approximately 129 miles. 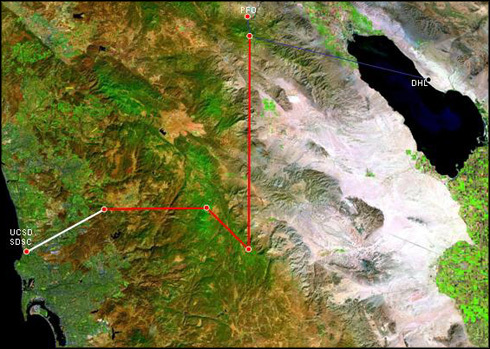 The connectivity originates at the San Diego Supercomputer Center, travels on to Mount Woodson, Cuyamaca Mountains, Mount Laguna, Toro Peak, and then finally reaches the geophysics sites of Piñon Flat Observatory (PFO) and Durmid Hill (DHL). While Piñon Flat sits between the active San Jacinto and San Andreas faults, Durmid Hill is located at the southernmost end of the San Andreas, next to a portion of the fault with an estimated seven meters of slip deficit. To learn more about strainmeters, please see "Long-Base Laser Strainmeters: A Review" by Duncan Carr Agnew and Frank Wyatt (January 6, 2003) at http://repositories.cdlib.org/sio/techreport/2/. For more information about the Piñon Flat Observatory and Durmid Hill sites, please refer to http://jacinto.ucsd.edu. ROADNet information is available at http://roadnet.ucsd.edu.